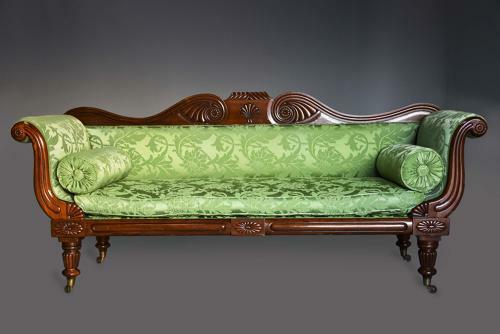 This sofa consists of a shaped mahogany back with a central carved gadrooned design with carved shell decoration below with carved scrolling designs to either side with carved roundels. This leads down to the double scroll ends consisting of carved and shaped arm supports with carved roundels. The front rail consists of a carved oval design to the centre, this design also replicated at the top of the two front legs, these being turned and reeded with turned legs to the back, all retaining their original brass castors. The sofa is in excellent condition for age, is of stable construction and can go straight into a home, the green silk fabric is in good condition but the sofa could of course be re-upholstered once purchased in a fabric of choice.